A bridge is made up of two crowns for the teeth on either side of the gap. These false teeth are called pontics and can be made from gold, alloys, porcelain, or a combination of these materials. 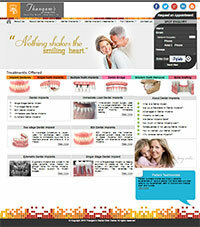 Dental bridges are supported by natural teeth or implants. Distribute the forces in the bite properly by replacing missing teeth. Traditional bridges: involve creating a crown for the tooth or implant on either side of the missing tooth, with a pontic in between. Traditional bridges are the most common type of bridge and are made of either porcelain fused to metal or ceramics. 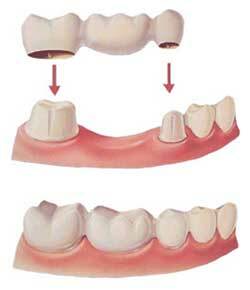 Cantilever bridges: are used when there are adjacent teeth on only one side of the missing tooth or teeth. Resin-bonded bridge or a Maryland bridge: are made of plastic teeth and gums supported by a metal framework. Metal wings on each side of the bridge are bonded to your existing teeth.